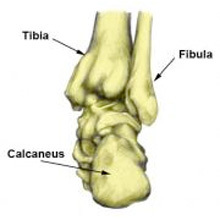 One test to help diagnose a stress fracture of the heel bone is the ‘squeeze test’. The therapist squeezes the back of the heel from both sides. If the pain is reproduced then the test is positive and this may be an indication of a stress fracture. A bruised heel is unlikely to be affected in the same way with this test. If crutches are not a viable alternative then wear comfortable training shoes with a cushioning midsole rather than hard, flat work shoes. If you have to wear hard-soled shoes, then use a gel heel pad or cushioning insole to help protect the heel and allow it to rest. It is important to maintain fitness with non-weight-bearing activities, such as swimming or cycling. See a sports doctor or professional practitioner who can confirm the diagnosis and advise on treatment. In some cases, a plaster cast is applied for 2 – 6 weeks if the pain is severe. This will ensure a complete rest. When the athlete does start back running they must ensure the muscles in the lower leg are stretched and supple. A gradual return to full training is important.